The Island of Curacao has many wonders to enjoy. Take in the most beautiful sunset you'll ever see, snorkel before breakfast, dive right from our beach, teach your children to swim or eat at one of two restaurants located at Playa Lagun. All of these are at your fingertips from Lagoon Ocean Resort. The waters are calm and the sea life is abundant. The climate is warm, yet our trade winds keep you comfortable. Curacao is located outside the hurricane belt just east of Aruba in the Caribbean where it never rains for very long. This unit sits approximately 20 feet above sea level and less than 10 feet from its edge. It features a second floor Master Bedroom Suite with private bath, loft/sitting room and two sets of sliders to a large terrace which provides a breath taking view of the sea and sunset. Granite counter tops have been added to enhance the beauty of this exceptional unit. No matter where you look, the view is nothing less than spectacular. Leave the windows open and fall asleep to the sounds of the sea. Lounge in the pool just outside your door or walk down the steps to Playa Lagun. A dive shop is located at the beach below us for your convenience. Christoffel National Park and Shete Boca are about 15 minutes away. Take a 35 minute drive into Willemstad and window shop or take a walking tour that highlights the beautiful Dutch architecture. The Aquarium with its Dolphin Academy is a favorite for the kids. You are sure to run out of time before running out of things to do and see. We have a Residence Manager on site to attend to your needs and ensure a carefree stay. A small group of Americans from Pennsylvania and New Jersey are proud owner of this unit. This beautiful 3 bedroom, 3 bath unit is owned by a group of Americans who fell in love with Curacao and specifically this unique property. The people, the climate and the crystal blue water are reasons we love the island. The view from this unit is unlike anything else you'll find on the island and why we bought here. View...View...View and proximity to the beach. Two restaurants are available at Playa Lagun. Electric to run aircos extra. Beautiful new Granite counter tops..stovetop, toaster oven but no oven. Newly built loft/sitting room on second level provides beautiful view of sea and sunset from inside sliders or out on balcony as seen in picture. Randal W.Where do you live? The people were easy to work with and everything was great as far as cleanliness. Location was great and the views from the porch were unforgettable. Diving and snorkeling from the laguns and beaches in the north end were awesome. That said, the distance to town was pretty far and we only make one trip to check it out. No need to leave the north end if all you want is secluded beachs. Playa Lagun was nice but the beach was small and very little shade to sit on the beach and enjoy. We ended up going to other beaches most days. Richard at the dive shop was the best, really enjoyed friendly helpful nature. He pretty much led us into the right direction for diving. Dive shop is set up very nice with rinse tanks and storage available at the shop. Drive right up to the shop, load and go. Now for a few minor issues that keeps me from giving 5 stars. Kitchen was really difficult for cooking. No real oven (although we knew this going in) and limited on cookware. Surprised there was no beach towels or even soap in soap in the bathrooms. My biggest complaint would be the fact that you get charged for air conditioning which for us was not an issue for us because we left windows and doors open all day. The issue was many of the windows and even the sliders has no screens which meant that flies and other insects were free to come and go. If you are going to charge for AC, at least have good screens on the windows and doors. One time we even has a bird stop by for a visit. This is our second week-long stay in this home. It has beautiful views of the bay (Playa Lagun) and a wonderful opportunity to have local fauna (Venezualian troupials, bananaquits, brown throated parakeets, Iquanas) visit you as you sit on the patio and enjoy the views of turquiose water and sunsets. This home (Lagoon Ocean Resort #16) has three bedrooms and three bathrooms but I would recommend it for no more that two couples. The kitchen is well-equipped, and there is a local minimart about a ten minute drive, in Barber. For a full supermarket, though, you'll have to drive about 35 minutes to Centrum supermarket. Great snorkeling by walking down the steps to the beach, or visit my favorite snorkeling beach, Klein Knip, which is about an 8 minutes drive from Playa Lagun. There were lots of green turtles in Playa Lagun during our stay. The largest one sleeps in Lagun Bay overnight. We have just nothing but good to say about this place. We will come back some day for sure. The view, the ocean, the snorkling, everything is amazing. Thank you! I'm so glad to hear you enjoyed your time in Curacao. We stayed in this bungalow with our friends for 9 days. It can comfortably hold six people because there are 3 bedrooms, each with two twin beds, as well as three bathrooms, each with a shower. We were a group of four people, however. The kitchen is fully equipped so that you can stock up at Centrum supermarket in Willemstad, about 35 minutes away, and prepare your own food. There are also two nearby restaurants. The onsite restaurant, Bahia, has good food. We didn’t care for the food at the other restaurant which is just off the public parking at Lagun Beach. The resort had mostly Dutch guests during our stay, though there were Americans as well. The management, father Peter Koster and son Ben, are friendly. The resort is quiet and well—run. Keep in mind that there are “garden view” and “ocean view” bungalows. This particular bungalow has a beautiful ocean view. You can sit out on either the 2nd floor or 1st floor balconies and enjoy the ocean view by day, and the stars/planets at night. There is a coin operated washing machine and dryer on premises. That being said, the resort is located off the beaten path. It is a 35 minute drive to the fully stocked Centrum supermarket in Willemstad. Alternatively, there is a decent minimarket (Centro or Centru Minimart) located in Barber, a 10 minute drive from the resort. I would recommend this place for avid snorkelers. You can walk down the resort’s private staircase which leads you directly to the beach, and snorkel each day. The water is calm, and this is a good place to go for new snorkelers, as well as experienced onces such as us. Similarly, you may want to try night snorkeling because the water is so calm, and the lights from the resort help you find your way. For snorkeling at night, you will need to bring or rent a dive light. 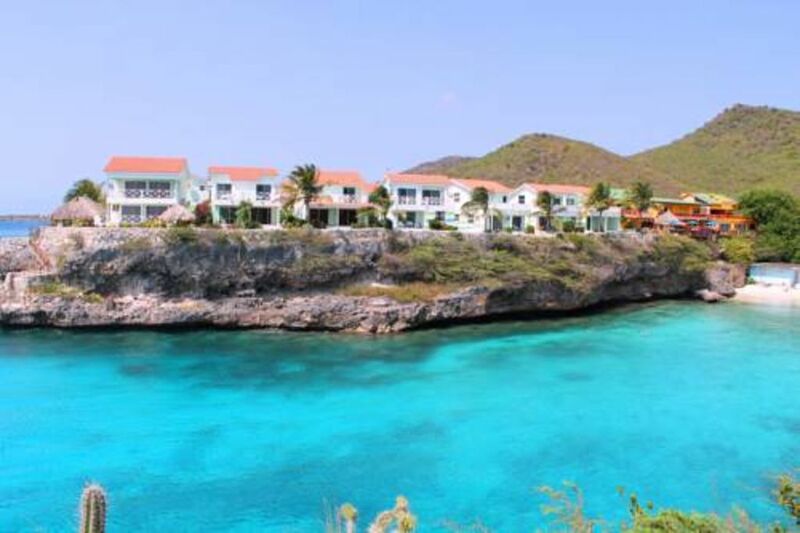 If you don’t love to snorkel, I would recommend you stay at a more centrally located resort in Curacao. Finally, I should mention that about 10 minutes away is Playa Grandi (also called Playa Pescador) where you are guaranteed to see sea turtles. The local fishermen discard portions of their catch into the sea, and this has led to the turtles making that beach their home. This is a great place to stay if you love to swim and Snorkel. Nice and Quiet too with no cars in the background. The deck is a ten ! Thank you so much for your feedback. We are so happy to hear you enjoyed your trip! My husband and I traveled with our ten month old baby and my mom. We also had my brother come for a couple of days as well. The condo was huge and we all had our own rooms and bathroom. The living area was nice and we loved having a kitchen. The view of Playa Lagun can not be beat! What a gorgeous view from the downstairs outside patio and the upstairs HUGE patio. The pool was right out the back door as well as the outside shower which was great to wash off our snorkel equipment. The condo is in a great location to Bahia Bar and restaurant which we enjoyed for many meals. The staff and food are excellent! Not to mention the unbelievable view!! The stairs leading to the beach were convenient as we snorkeled each morning and evening in the Lagun. We have snorkeled and scuba dived all around the world and we would have to say the snorkeling at Playa Lagun is top five. We saw turtles, octopus, crabs and tons of fish. If you are looking for a nice size place for your family, great snorkeling and a even better view this place is for you!! Due to the high cost of electricity, we require all guests to pay for their actual AC electric usage. Average use costs $3-$5 USD per day.